Stormy Seas combines a vivid and contemporary collage-based design with dramatic storytelling to produce a book that makes for riveting reading as well as a source of timely information. These remarkable accounts will give readers a keen appreciation of the devastating effects of war and poverty on youth like themselves, and helps put the mounting current refugee crisis into stark context. This is a timely and powerful story about resilience and determination. The book doesn’t pull any punches. It is the true stories of five refugee children who face real danger as they escape by sea. One sails aboard an ocean liner and the other four drift in open, unseaworthy boats that are overloaded. There are no lifejackets or bailing cans. Food and water is scarce. They face stormy weather and pirate attacks at sea. The boat refugees leave with hope in their hearts of seeking asylum and freedom from persecution, civil war, drought and natural disasters. They arrive at their destinations ill and needing medical treatment. Some end up in detention or refugee camps. Reading stories about immigrants that span 80 years, offers readers a greater insight into the current refugee crisis in the Middle East, South America and Africa. It is interesting to compare the past with current events. The stories of the past echo similar themes refugees face today — they are not welcome by many countries. They are ostracized and treated like prisoners. This is an excellent and current book for middle grade students and belongs in school libraries. Stormy Seas features a beautiful collage design with historical fact sidebars, maps of each child’s journey, timelines, quotes from leaders, and refugee data that includes costs and how many boat people die at sea. This book format is perfect for reading true stories and for research projects. 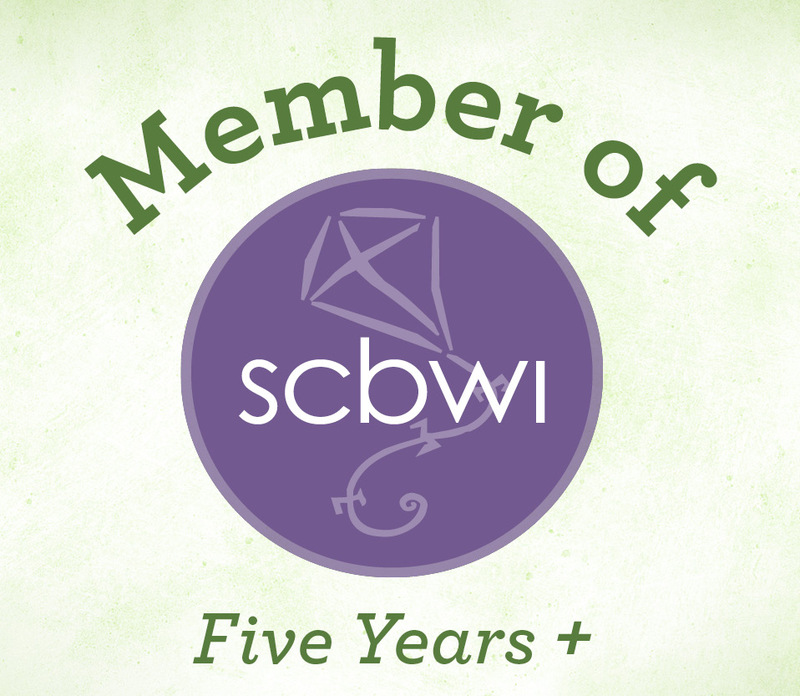 Readers will gain new insights into a social justice issues that date back 600 years. Make sure you read Introduction and the Brief History of the boat people which dates back to 1670 with the Huguenots leaving France for England seeking refuge from religious persecution. Synopsis: This is the story about Mildred Jeters, an African-American girl, and Richard Loving, a Caucasian boy, who live near one another, are childhood friends, and fall in love. Mildred becomes pregnant in 1957 and delivers their first son. and a second son in 1958. They want to get married, but in Virginia, interracial marriages are against the law. They decide they won’t allow Sheriff Brooks and the government to tell them who they can marry. They travel to Washington D.C. and are married by a preacher. When they return home to Caroline County, Virginia, they have to be careful. They are arrested and put in jail. They are released as long as Mildred lives with her parents and Richard lives with his family. Even though they hire an attorney and go to court, they are not allowed to be seen together. They move to Washington D.C. to live with family. Richard continues to work as a brick layer in Caroline County and drives the 90 miles back Washington D.C. to spend the weekends with his wife and children. After living in Washington D.C. for five years, Mildred hates the noise and crowded city and longs to raise her children in rural Virginia. After being arrested sneaking home, they contact the American Civil Liberties Union and meet an attorney, Mr. Cohen. He is eager to help the Loving’s face each stage of the legal system and takes their discrimination case to the highest court, the U.S. Supreme Court. Patricia Powell chose to write the narrative of this powerful story in free verse, alternating the voices of Mildred and Richard. It effectively achieves a balance between the Loving’s beautiful love story and their determination to fight the discrimination to live as husband and wife and win. The last thing the wanted was publicity. They wanted to raise their growing family at home in Virginia, where their children could run barefoot through the grass, see the stars at night and be near grandparents. The author and artist craftily weave factual information, photographs and illustrations around the lyrical narrative, which lends itself to “visual journalism,” says Strickland. There are page inserts about court rulings on school segregation; the Virginia state, federal and supreme courts refusal of interracial marriages; and the U.S. Supreme Court final ruling in 1967 to uphold the 14th Amendment. There are news clippings from former Alabama Gov. George Wallace and Dr. Martin Luther King, Jr., a 1958 map showing the 24 states that banned interracial marriage. There are photographs showing the contrasts between white schools and black schools, protest marches for and against integration and equality. I’m in awe of the massive amount of research that went into this masterful book. Strickland’s artwork of Richard and Mildred and their family throughout their story is a light and moving tribute to their deeply moving journey that lasted about 10 years. She used photographs from LIFE magazine to create her lively and brush and pen illustrations, which compliment the conversational text between Richard and Mildred. Middle Grade students will find this oversized book a page-turner. Because it is in verse, it is a quick read. It belongs in every school library. It is a beautiful love story and a book full of resources with historical timelines and more information about the Loving family. June 12 will be the 50th anniversary of the Supreme Court ruling by Chief Justice Warren on Loving Vs. Virginia. Book Jacket Synopsis: All children should be treated equally, whether they are boys or girls. Boys have sisters, mothers, aunts, and grandmothers. They care about the choices that their mothers have, and the opportunities that their aunts are given. They want to see their grandmothers get the respect they deserve, and that their sisters have the same rights as their brothers. Because boys love their sisters, they want them to go to school, just like they do. Because boys are sometimes given chances girls are not, they know that this is not right. And as brothers and sons, nephews and future fathers, they can help to make sure that all children have voices and choices. As A Boy is an inspiring global story about boys and their families. Each page features breathtaking, expressive, and powerful photographs that will melt your heart and touch your soul. No matter how difficult lives can be, there are so many smiles on their faces and a glimmer of hope. I am a fan of Plan International books. They address tough issues and teach youth about how difficult life can be for children around the world. Since we are a global family, youth need to know that boys are treated differently than girls around the world. Their needs are put above their sisters. But, boys also face the burden and pressure of growing up quickly to be a man, to work, to support their families, to fight and to be brave. As a Boy is a perfect companion book to Because I am a Girl: I Can Change the World, as well as The Way to School, both personal favorites of mine. Click on the titles to read my reviews. All three of these books are valuable resources for school libraries, so that children will have an understanding of what it is like to be a boy or girl in a third world country. Since so many children live in poverty, education is vital to their futures. Many times going to school involves hurdles and risks. Plan International was founded in 1937. It is one of the world’s oldest and largest international charities, working in partnership with millions of people around the world to end global poverty. Not for profit, independent and inclusive of all faiths and cultures, Plan has only one agenda: to improve the lives of children. Proceeds from all the book sales are used to support programs benefitting children around the world. Resources/Activities: This is an excellent classroom discussion book to talk about how boys and girls are treated differently around the world. Pair As a Boy with the other two books mentioned above, so students get a better look at the gender inequality. Ask students if the feel they are treated equally in their country of origin. Make a list. Ask the boys and girls how they would feel if they had to change places. And, celebrate gender equality with other children on the International Day of the Girl, Oct. 11, 2016. Openings: Two children from Pakistan spoke out against injustice in their world. Their bravery in the face of great danger is an inspiration to all who know their stories. “Who is Malala?” the Taliban demands, looking into the school van. 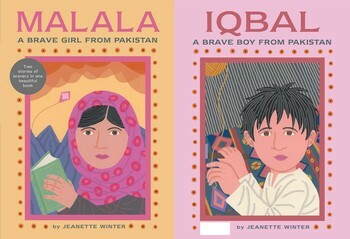 Beech Lane Books Synopsis: Meet two heroes of Pakistan who stood up for the rights to freedom and education in these inspirational nonfiction tales from acclaimed author-illustrator Jeanette Winter. Two stories of bravery in one beautiful book—including the story of Malala Yousafzai, a winner of the 2014 Nobel Peace Prize! One country: Pakistan. Two children: Iqbal Masih and Malala Yousafzai. Each was unafraid to speak out. He, against inhumane child slavery in the carpet trade. She, for the right of girls to attend school. Both were shot by those who disagreed with them—he in 1995, she in 2012. Iqbal was killed instantly; Malala miraculously survived and continues to speak out around the world. 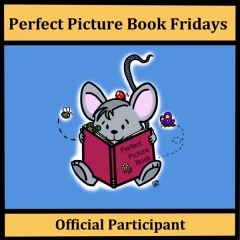 It is an illustrated picture book biography. Great pairing of two very brave children in one book. Read Malala’s Yousafzai’s story first and then flip the book over and read Iqbal Masih’s story. The text is very simple and childlike; the words powerful. This is an inspiring book that will introduce children to the courageous boy and girl who share a common interest–they want to attend school at a high cost to their lives. The colorful digital illustrations capture the story in a manner that won’t frighten children. Mid-way through the book where the stories meet, an illustration depicts Malala and Iqbal flying kites on a double-page spread. Malala is holding onto to the string of her kite, while Iqbal (a shadow of a boy) lets go of his string. This page is symbolic of their intertwined lives and a kind of passing of the torch to Malala who refuses to be silenced by bullets and becomes the voice for human rights. This is an excellent introductory book to use in the classroom. 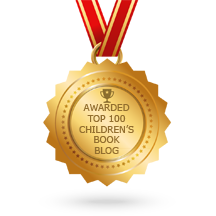 Resources: There is an author’s note at the beginning of each story that highlights each child with more detail. This belongs in every school library. 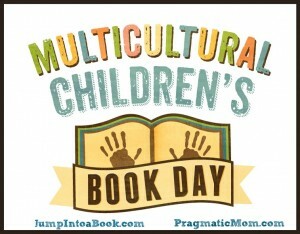 It is a great way to discuss the plight of children living in other countries. How are their lives similar and different? Encourage students to write a letter to Malala. Jeanette Winter is the acclaimed author/illustrator of many highly regarded picture books, including The Librarian of Basra: A True Story from Iraq; Mama: A True Story in Which a Baby Hippo Loses His Mama During a Tsunami, but Finds a New Home and a New Mama; Wangari’s Trees of Peace: A True Story from Africa; Nasreen’s Secret School: A True Story from Afghanistan; Biblioburro: A True Story from Colombia; Henri’s Scissors, and Mr. Cornell’s Dream Boxes. 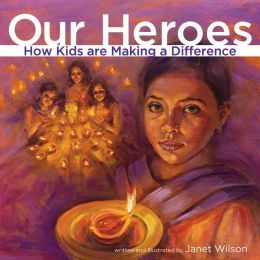 Book Synopsis: Our Heroes is a collection of true stories about child activists who have opened their hearts and minds to creatively solve the global problems of poverty, hunger and the right to receive an education. Meet Andrew Adansi-Bonnah, 11, from Ghana, who raised thousands of dollars to feed refugee children in Somalia. Alaina Podmorow, 9, from Canada, founded an organization to raise money to train Afghani teachers, pay salaries, and buy books to educate girls and women, and support an orphanage. Kyle Weiss, 13, from the USA, and his brother Garrett, raised money to build soccer fields near schools across Africa where children who have experienced trauma or conflict could heal. Arti Verma,12, from India, became an agent for social change when she spoke to her village leaders about abolishing the discriminating caste system. Arti and her classmates led rallies and lower caste children –the untouchables– were allowed in schools. 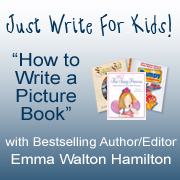 Janet Wilson is an artist and author of many picture books. 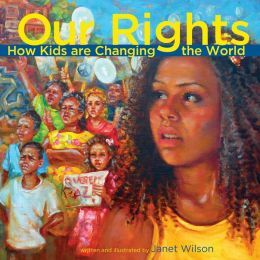 I’ve reviewed her other two books on child activism, Our Earth: How Kids are Saving the Planet and Our Rights: How Kids are Changing the World, which are popular with educators and students. Winter’s books have won many awards. Resources: The book is a resource. At the end there is a section for students on “What YOUth Can Do,” that will spark many lively discussions and encourage kids to think about what they may do alone or together to make the world a better place. What will you do? Visit Janet Wilson at her website. 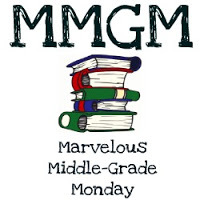 Book Synopsis: Meet some amazing girls! They are from all over the world and tell stories of their lives that are sometimes hard to imagine. In Because I am a Girl we hear of the barriers and dangers that they, and millions of girls like them face every day. Despite the hardships, they have great hope for the future. All are willing to do whatever they can to make their lives and those of their families and communities better. Read about: Lucy, an orphan in Zimbabwe, who struggles to find enough food for herself and her sister; Kathryn from South Sudan, who teaches the younger children in the refugee camp where she lives; Farwa, who was destined to become a child bride in Pakistan; and Fahmeeda, a Youth Ambassador from Canada, who works to protect the rights of women and children around the world. Why I like this book: Rosemary McCarney with Jen Albaugh, has written a powerful, inspiring, and uplifting book for middle grade readers that belongs in every school library — in multiple copies! It is a wonderful resource for students and teachers. The layout of the book is done with thought and purpose. Readers are introduced to the stories of poverty-stricken girls who deal with barriers and hardship. Each story is followed by a “Did You Know” section, with facts and information about other girls around the globe facing similar problems and the critical need for education. In later sections the authors focus on hope and action. You feel strength and determination as the voices of the girls grow strong about what they can contribute. By the end of the book you see the girls uniting to form clubs to work on projects that will benefit their communities. These girls will become the future teachers, nurses, midwives, doctors, lawyers, business women and leaders. They will be the heart of their communities, bring growth and change, and turn the tide away from poverty and towards a more peaceful world. This book reminds me of what the Dalai Lama said at the Vancouver Peace Summit in 2009: “The western women will save the world and bring peace.” It will also be educated girls in small villages around the globe bringing change to their communities and unity to the world. Many photographers contributed to the bright and bold photographs that highlight each story. The book is beautifully packaged. 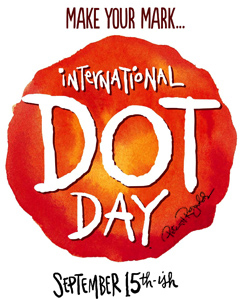 Rosemary McCarney is the author of a picture book Every Day is Malala Day. She is President and CEO of Plan International Canada, and spearheads the Because I am a Girl global initiative. She led the call for United Nations to declare October 11 the “International Day of the Girl” — a day each year to recognize and advocate for girls’ rights and end global poverty. Proceeds from the sale of this book will be donated to Plan’s Because I am a Girl Fund. Plan International is one of the world’s largest international charities working in 50 developing countries, including the United States. Jen Albaugh is a former elementary school teacher and librarian working as a freelance writer and editor in Toronto who is greatly inspired by the work of Plan and the Because I am a Girl initiative. 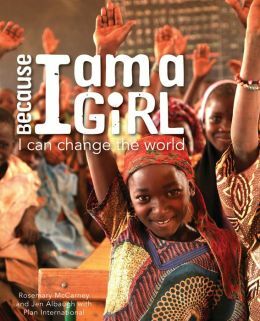 *I was provided with a copy of “Because I am a Girl” in exchange for a fair and honest review.